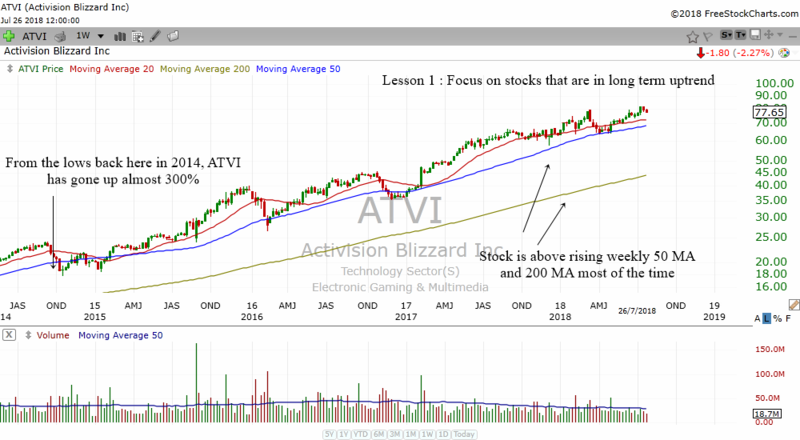 In today's article we will study ATVI's stock chart and draw some technical analysis lessons from the chart. Let's see what we can learn from ATVI's price action. It is always great to study a bit of history because history often repeats itself. Chart patterns also tend to repeat themselves and if we as traders learn to spot them well, we might just be able to capitalize on these repetitive patterns in the future. Take a look at the weekly stock chart of ATVI below. From the lows back in 2014 on the left, ATVI has risen by almost 300%. That is one mighty impressive feat for any stock. If one has invested in this stock they will be sitting on a nice gain of almost 300%. Not bad at all. 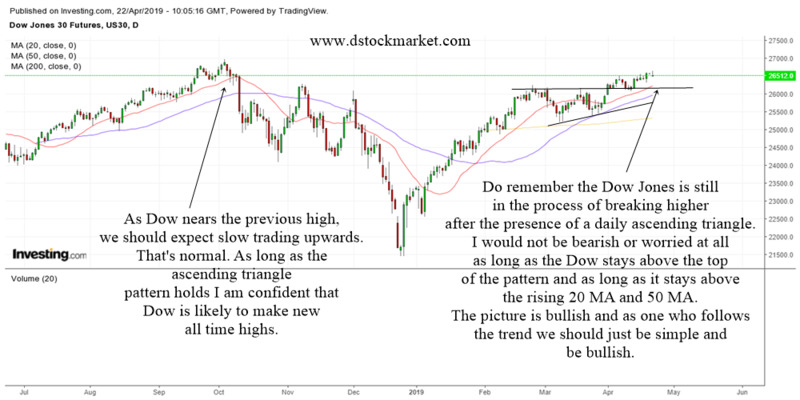 In our search for the next big thing in the stock market, one lesson we should always remember is to "focus on stocks that are in a long term uptrend". So, what is an uptrend? Sure there will always be corrections along the way, but every drop is met with another rise that brings the stock higher and higher. Take a look at the stock chart above. Notice how ATVI has been staying above the rising weekly 50 MA (blue line) and rising weekly 200 MA (yellow line) most of the time. This is a picture of strength. Therefore, if you want to find a big winner like ATVI, start to focus on stocks that are trading above their rising weekly 50 MA and weekly 200 MA. Usually, any dips in a stock that is in a weekly uptrend is buyable. 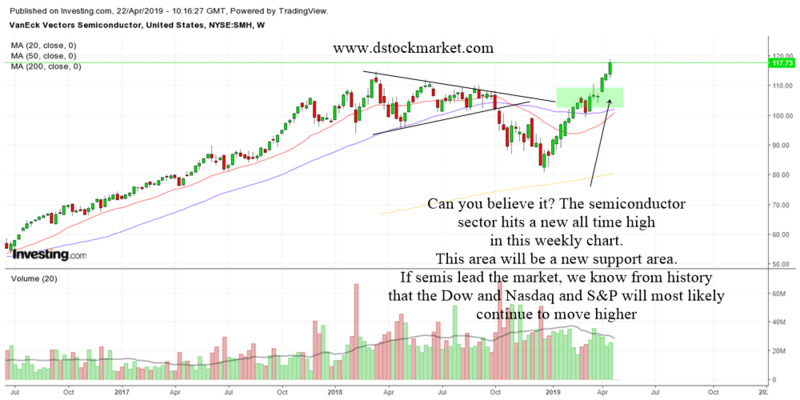 Once you have established that a stock is in a weekly uptrend, the next step is to find buyable dips. Stocks do not go up in a straight line. Most of the time they go up and down like waves in the sea. 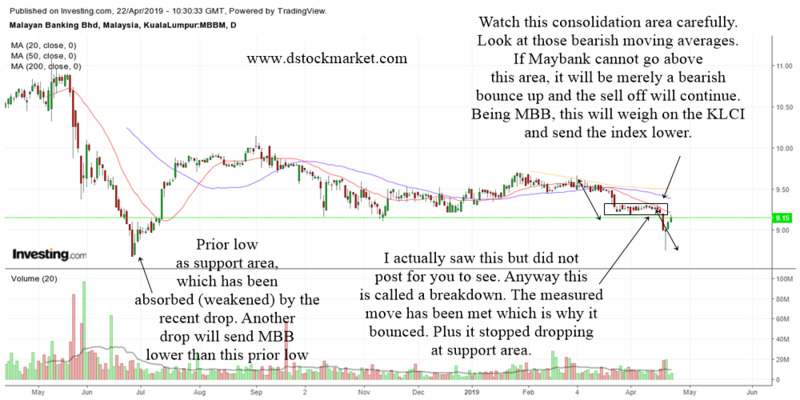 They may drop to an area of support or get oversold and that is the time we want to see if we can buy the stock cheaper. 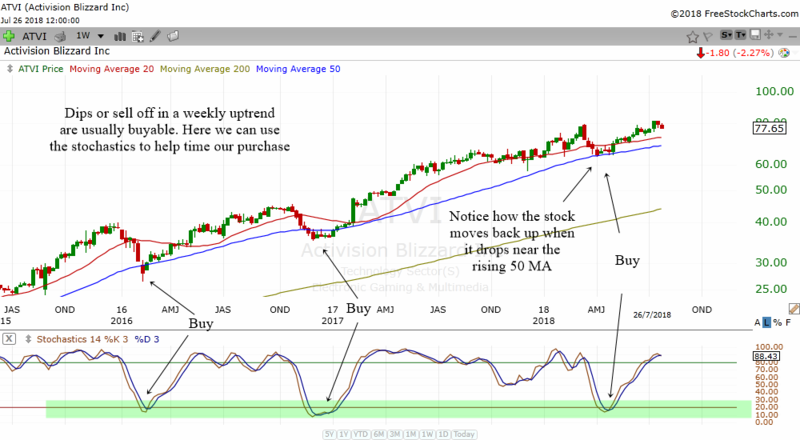 The chart above shows the weekly chart of ATVI but this time I have added the stochastics 14,3,3 indicator. If you are not familiar with the stochastics indicator, you might want to check out the lesson on stochastics. Generally, when the stochastics is below 20, the stock is considered oversold. When the stochastics is above 80, it is considered to be overbought. When a stock is in an uptrend, we ignore overbought readings as the stock can stay overbought for a long time. But we pay attention to oversold readings when the stock is in an uptrend because they can often give us great buying opportunities. If you look at the chart above, you will notice that there were 3 great times to buy the stock when the stochastics were oversold. Notice how the oversold reading coincided with the stock dropping near to the weekly rising 50 MA. The combination of two technical concepts can give us a powerful reversal signal. Let us now take a look at some technical analysis lessons from the daily chart. Some of these chart patterns can be traded. 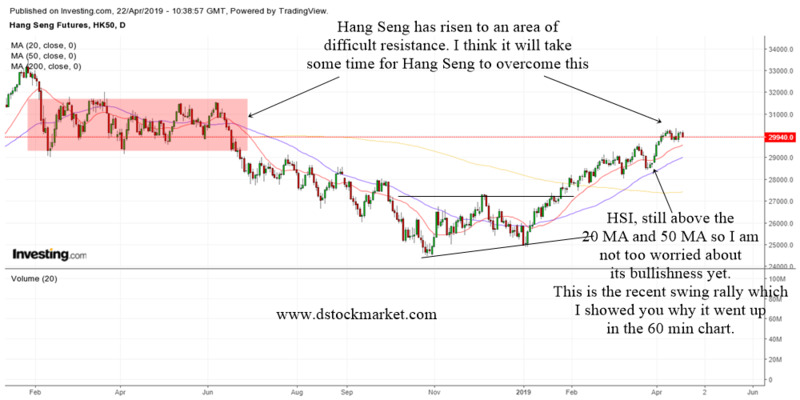 Most patterns in the daily chart are very suitable for swing trading. Therefore, the more patterns you recognize the more swing trade opportunities that you will have. We will start from the left of the chart to the right hand side of the chart. But before we start, I want you to remember that this stock was in a weekly uptrend. Correct? Therefore, any dips are potential buying opportunities. Breakouts are also potential buying opportunities. First of all, we had a bottoming tail or a long legged doji. This candlestick pattern is a bullish reversal candlestick pattern. The stock sold off at first but eventually closed higher by the end of the day. This tells us that the bulls are taking control of the stock. Notice how the bottoming tail happened at the 50 MA. The 50 MA can often act as a powerful support. Next, we have a double bottom pattern that happen at the 200 day moving average. The double bottom pattern is a bullish reversal pattern while the 200 day moving average can act as a powerful support. So when you see a double bottom pattern appear at the rising 200 day moving average, it can be a buy signal. The stock then had a bullish cross. My version of the bullish cross is when the 20 MA crosses back above the 50 MA. This is usually a sign of bullishness where the shorter MA goes back above the longer 50 MA. ATVI traded sideways as it formed a bullish cross and then it had a bullish box breakout. This is where the stock breaks above a sideways consolidation. 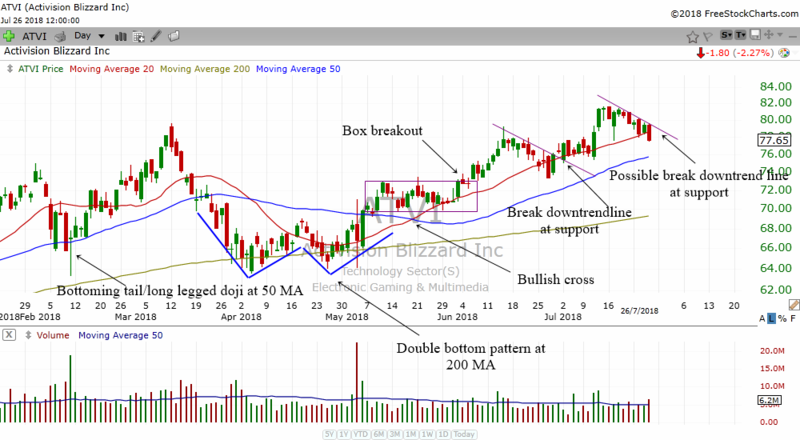 As the stock reaches the former high, it declines a bit but then sets up another bullish pattern. I call it the break downtrend line at support. 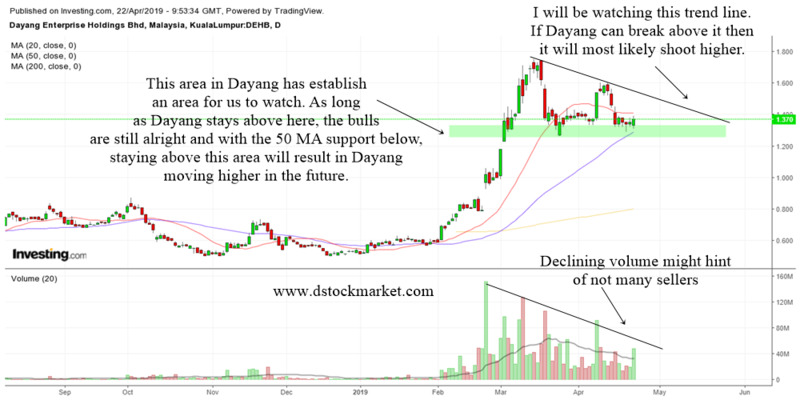 The stock might also be forming another break downtrend line at support. Notice how the stock is now trading above its rising 20 MA and rising 50 MA in the daily chart? This is a picture of strength and if the stock continues to trade above these 2 MAs then it is likely to go on making higher highs. That's all for today, hope this technical analysis lesson adds to your library of knowledge.